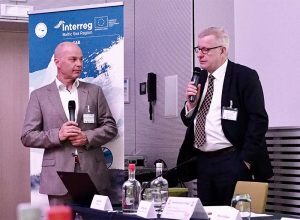 Inadequate co-operation and safety cultures roused the most discussion in the event organised by three EUSBSR Flagship projects on Current policy issues and their compliance in maritime and ports safety and security. 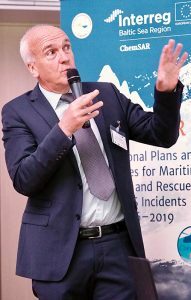 Professor Lauri Ojala from the University of Turku led the discussion between the invited guest speakers and the expert audience to induce different views on the matter and, perhaps, generate more co-operation to enhance maritime safety and security. The discussion took place in Brussels on 26 April. 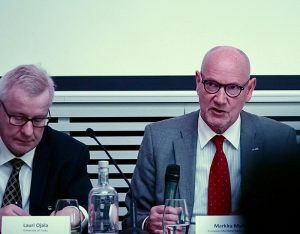 Mr Markku Mylly, Executive Director of EMSA, highlighted the significance of shipping to the European Union as 90% of its external trade and 40% of the internal is carried by sea. He emphasized the importance of safety and EMSA’s role in the heart of the EU maritime safety network providing assistance to the Member States and European Commission in the development, implementation and monitoring of the maritime legislation, providing operational assistance, improving co-operation, and carrying out operational preparedness, detection and response tasks. In addition, Mylly brought to attention the international, multicultural and technological nature of the shipping industry, and how it demands economic efficiency, profitability, and increasingly, also environmental sustainability. MEP Merja Kyllönen started her introductory speech by pointing out that the European Commission had announced the year 2017 to be a maritime year. Also the European Parliament has several legislative proposals related to maritime industry and ports under discussion, such as safety rules and standards for passenger ships, registration of persons sailing on board passenger ships, and inspections system for ro-ro ferries and high speed passenger crafts. Kyllönen told that discussions related to environmental aspects of shipping and ports have been active in Brussels as well. 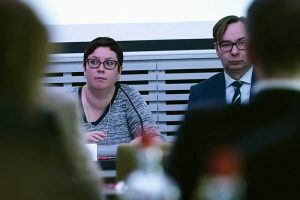 Kyllönen revealed that she was among those MEPs who voted for the ambitious climate policy and inclusion of shipping in EU emission trading scheme. However, the fundamental reason to reduce emissions is not to fulfil the international agreements but to maintain the earth in a liveable condition. She also noted that international shipping is the only transport sector with no contribution to the climate goals in Europe. She urged to build partnerships in order to create co-operation in the field of shipping and even suggested that the contributing to lower emissions of transport and logistics might be a prerequisite to receive EU CEF funding for future projects. Kyllönen wanted to emphasize the important role of safety in shipping and port activities, and also in the prevention of environmental risks, therefore, the three projects hosting the event are significant, also from the environmental point of view. Mr Bogdan Oldakowski, Secretary General of the Baltic Ports Organization, started by stating that ports try to tackle all the issues on safety and security, and are heading towards sustainability in ports, although there are quite a number of different kinds of regulations to be taken into account. The EU strategy for the Baltic Sea region (EUSBSR) aims at the region becoming a model region for clean shipping. Despite the hard work ahead, the member ports of BPO have already adopted it as their policy in a slightly modified form: The Baltic Sea as a model region for green ports and maritime transport. BPO is working actively for clean and safe shipping. It has launched projects studying and analysing LNG bunkering as a compliance method with SECA. The principal achievements of the projects have been pre-investment studies to discover, for example, the feasibility of LNG terminals and bunkering vessels or producing safety manuals. The projects have also clarified how the ports must be prepared for future’s LNG bunkering. There are already experiences of safe LNG bunkering from vessels, such as Viking Grace, Polaris, and Turva. So, the Baltic ports are paving the way with their acquired experience. Mr. Norbert Denninghoff, HSEQ Manager of Neste in Rotterdam, presented the safety vision of his company: safe working day with zero injuries and incidents. What is needed to reach this vision is first of all, to have a sound attitude, which is a cultural element and the most critical element in the safety culture. Then rules and procedures need to exist and be followed, competence and training needs to be in order, and finally, proper behaviour and way of working is required of each. This will lead to safe working with no injuries and incidents. Denninghoff concluded with some key issues for regulators to ponder. First of all, a level playing field is essential to grow a healthy market. Secondly, on must be aware of innovations and use regulations as stimulators, for example, allowing multiple solutions and create room to grow and experiment. Finally, it is necessary to create win-win situations by regulations, such situations that have both public and political support, and support industry dynamics. Mr. Chris Addiers, President of the Federation of the European Union Fire Officer Associations (FEU), began by telling about the nature of his organization. FEU aims to establish good contacts with EU policy makers, such as the parliament, commission, committee of regions and other EU institutions. The three basic values of FEU are that it is democratic, independent and strategical. The FEU vision speaks for itself: A safer Europe for all. This includes actions like improving EU citizen safety, fire fighter safety, influence on policy formulation, sharing of good practices, and finally, improving crisis management. FEU is also active in relation to maritime and port safety. Addiers explained the on shore risk profile, which includes rather big cities with large or extra-large seaports. These are often combined with dense industrial zoning, and usually there are petro-chemical clusters. On shore response, on the other hand, comprises port fire services with their own specific port-related problems, such as population nearby the port, extremely dense transport structure, and hazmat concentration and COMAH industries. This all leads to an increased risk of major events. Addiers concluded by saying that FEU strongly supports the idea of an international network of excellence, for example, an EU Network for Maritime and Industrial Safety. 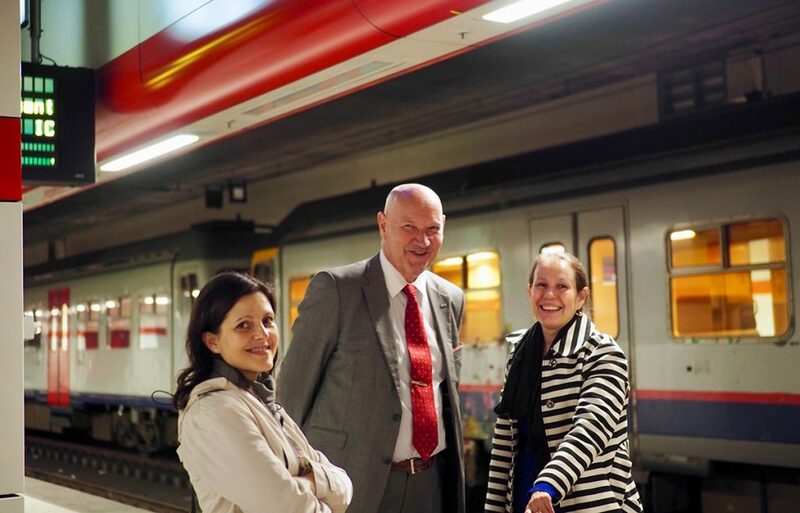 Addiers noted that Interreg projects are the start, but European structural cooperation and networking should be the final goal. As a conclusion of the presentations and comments, Ojala summarized that it is essential to identify the gaps and procedures in current regulations. There is also a clear need for better sharing of knowledge between the authorities and industrial players. We need to have thorough knowledge of safety cultures, locally, nationally and international. We still have a lot of work to do and we need to do the work together. We have heard from our guests from EC that there are financial instruments that support the safety development in the maritime and port field. For this we should build expert co-operation networks, as it is co-operation the reaching of goals requires. Finally, Ojala threw an idea into the air: perhaps some kind of a quality label for ports could be considered. Black list, white list, green list port, like the Vessel Triage type of approach? In any case, it would require hard work in ports and from the party to certify this kind of a label. 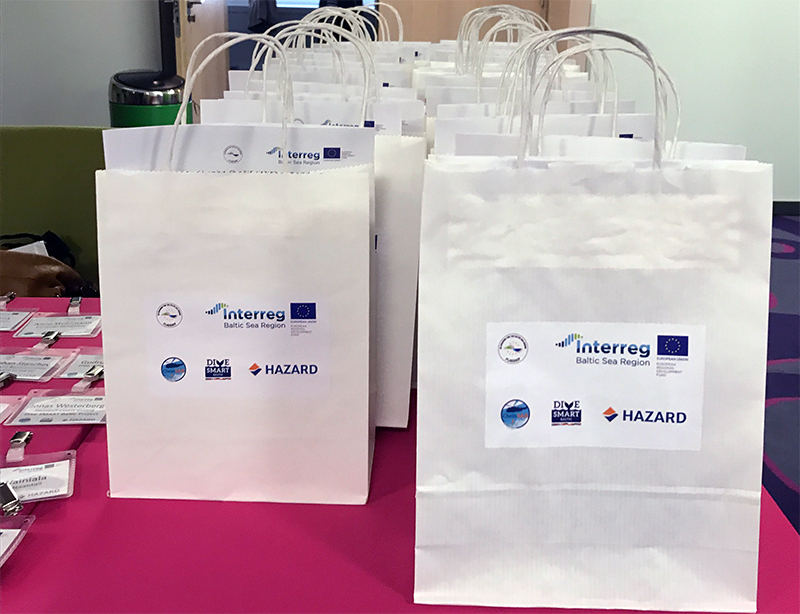 Three EUSBSR Flagship projects, ChemSAR, HAZARD and Dive SMART Baltic – all of which involved in and contributing to the maritime and/or port safety and security –, organised an event to discuss current policy issues and their compliance in maritime and port safety and security. 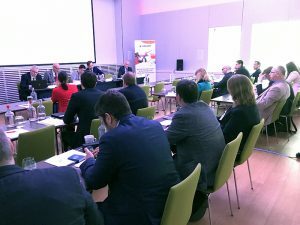 It took place on 26 April 2017 at Hotel Thon EU in Brussels. The aim was to involve decision makers and representatives of operative organisations and companies to present their statements and generate exchange of views on the topic, naturally with the help of contributing expert audience. The event attracted altogether about sixty participants.